Eighty eight percent of respondents to a new poll believe protecting the Great Lakes is important. And 55 percent are willing to pay more for consumer products as a result of increased regulations or enforcement to ensure the lakes are restored and protected. The numbers come from a second large survey by the IJC’s Great Lakes Water Quality Board. The survey was completed in January 2018 and is summarized in a poll report released in mid-July. The 4,250 respondents reflect a concerted effort by the board to be inclusive of all sectors of the population. Respondents live in the eight Great Lakes states (Illinois, Indiana, Michigan, Minnesota, New York, Ohio, Pennsylvania and Wisconsin) and the Canadian province of Ontario. This includes representative sampling of Indigenous people (First Nations, Métis and Tribes) from each lake basin to gain insights on their unique perspectives. The first survey was completed in late 2015. The whopping 88 percent feel it is essential to protect the Great Lakes from a variety of threats, including pollution and aquatic invasive species – a 3 percent increase from the 2015 poll. 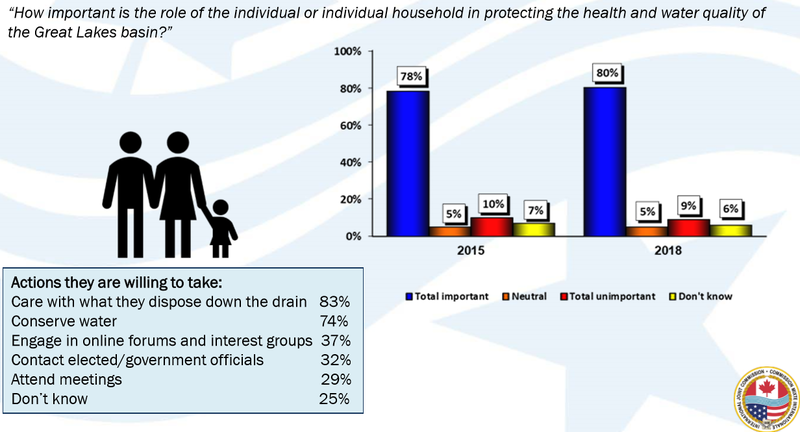 While 39 percent believe all sectors of society can play a role in protection efforts, 23 percent and 18 percent list federal and state/provincial governments, respectively, as responsible for the lakes’ health. As in 2015, all demographic groups and geographic jurisdictions view protection of the Great Lakes as highly important. Younger respondents, especially millennials (85 percent) and people who expressed liberal or progressive political viewpoints (87 percent), were most likely to feel it is important for the individual to play a role to ensure the lakes are protected and act on those beliefs. Also up 3 percent from the 2015 poll are those who feel it is important to protect the lakes for recreational purposes, even if they personally do not use them, at 89 percent. Those who use the lakes for recreation enjoy swimming and beach visits (35 percent), followed by 27 percent who enjoy fishing and boating of various kinds. 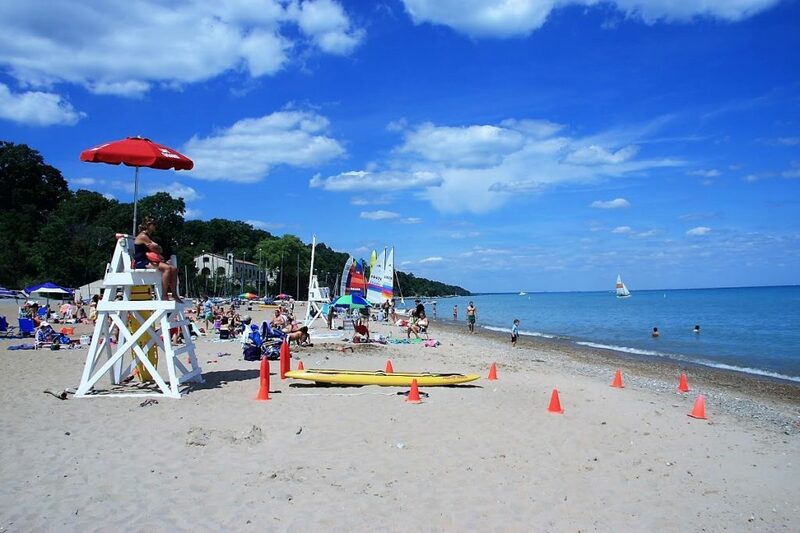 Lake Michigan is the most visited lake, followed by lakes Ontario, Erie, Superior and Huron, according to the poll. More than half of respondents believe there are too few regulations to protect the lakes, compared with 46 percent in the 2015 poll. Fifty three percent feel additional protections would have either no impact (30 percent) or a positive impact (23 percent) on jobs and the economy, while 27 percent felt there would be negative implications and 20 percent were undecided. Pollution (19 percent) is again mentioned as the most significant problem facing the Great Lakes. When combined with the third most mentioned issue, industrial pollution, 30 percent identify pollution as the most significant problem. Invasive species ranks second at 17 percent, followed by climate change, a new response in the 2018 poll, identified by 3 percent of respondents. In a new series of questions, residents were asked to rank the negative impact of 10 issues on Great Lakes environmental health and water quality. 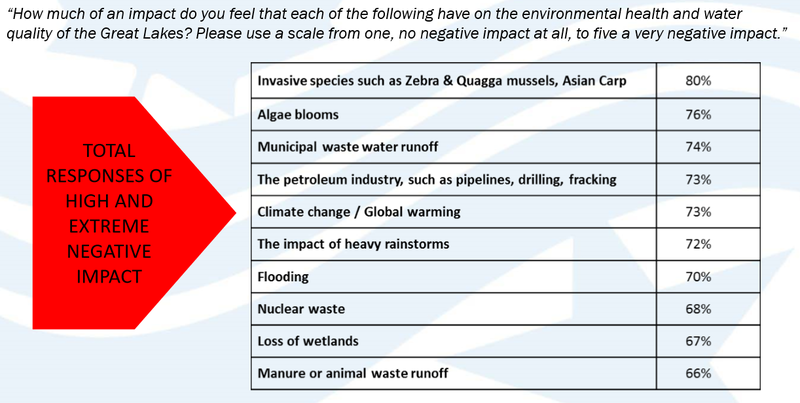 Respondents feel all 10 have highly negative to extremely negative impacts, including invasive species, algae blooms, municipal wastewater runoff, climate change, the petroleum industry (pipelines, drilling, fracking), the impact of heavy rainstorms, flooding, nuclear waste, loss of wetlands, and manure or animal waste runoff. This last issue also received the highest percentage of respondents who feel it has no or little impact (20 percent). While a large majority of those surveyed believe the Great Lakes should be protected for the benefit of fish and wildlife (79 percent), their economic significance to the region was listed first by 78 percent, followed by their importance to human health now and for future generations (74 and 77 percent, respectively). Eighty percent also believe each person is responsible for protecting the lakes, up 2 percent from the 2015 poll, which includes such actions as being careful of what they wash down the drain (83 percent), conserving water (74 percent), engaging in online forums and interest groups who address Great Lakes issues (37 percent) and contacting elected and government officials to express their concerns (32 percent). While 30 percent were unsure what steps they could take in 2015, 25 percent were unsure in the 2018 poll. 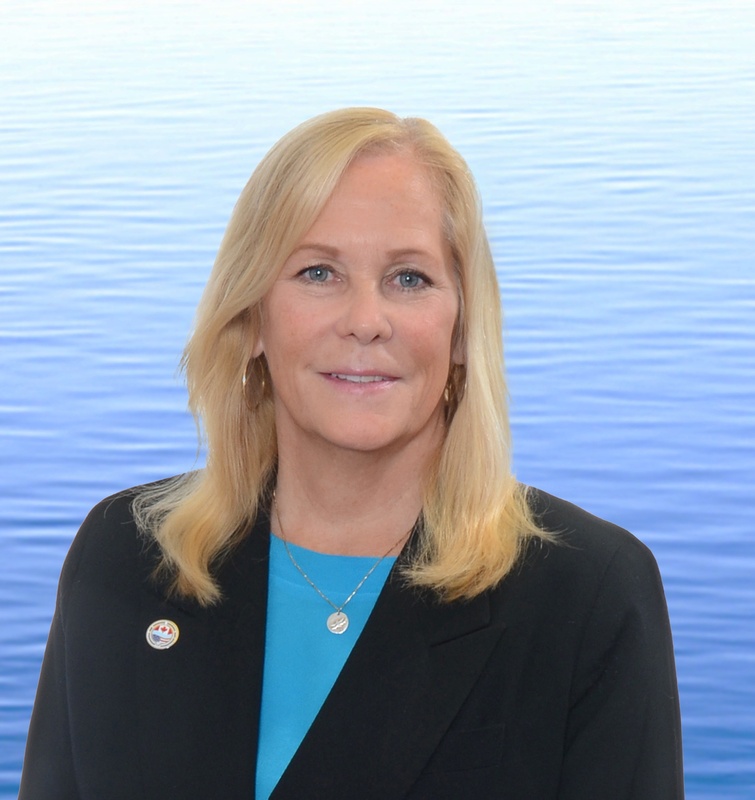 A large majority, 80 percent, feel it is important that an organization like the IJC exists to facilitate cooperation in Canada and the United States on issues impacting the Great Lakes, and ensure that the goals and programs outlined in the Great Lakes Water Quality Agreement are accomplished. This majority increased from 74 percent in the 2015 poll.